If you enjoy spending hours on end on beautiful beaches with the soft roar of the ocean waves for company and the thrill of a nip at the end of your line sending adrenalin coursing through your veins, Namibia’s shoreline is the place for you. Get your bait, hook, line and sinker ready and cast away. Namibia’s shoreline is one long stretch of beach, 1 572 km to be exact. Here and there a rocky shore or 100-m-high dunes interrupt the clean stretch of sand, but mostly… it’s beach. It is no wonder then that when, on any given day, you venture down to the coast you will see the small blurred figures of men with long rods in hand through the early morning mist that is drifting inland from the Atlantic. Because where there is beach as beautiful and clear as Namibia’s, and ocean waters as rich and full of life as the Atlantic with its cold Benguela current, you can be sure there will be fishermen casting their lines. Namibia is a fisherman’s dream! Angling along Namibia’s coast is possible all year, but November to March is widely thought to be the peak season, as summer brings with it warmer water and calmer seas. Experts say that the best time to cast a line is one week prior to full moon or one week after, a time in which tides are at their optimal levels. One of the biggest debates between Namibian hobby fishermen is location, location, location. However, Henties Bay seems to be regarded as the hub of the Namibian fishing community, and angling is indeed the most popular pastime in this little coastal town, about an hour’s drive north of Swakopmund. Some swear by fishing spots north of Henties Bay, others south, but no hole can guarantee a good day’s catch. Timing seems to be everything when it comes to a tight line and I suspect that sometimes luck has a great deal to do with it, too. Nevertheless there are a number of very popular fishing spots both north and south of Henties Bay. But if you prefer to steer clear of the crowds it is a great perk to be able to spot a good hole for yourself. And always remember that one of the biggest faux pas in fishing is to stop your car and cast a line right next to someone else. They got there first… go find your own spot! Anglers must be in possession of a fishing permit, obtainable from the offices of the Ministry of Fisheries and Marine Resources in Walvis Bay, Swakopmund and Lüderitz and/or the Henties Bay Hanganeni Fishing Centre. Permits cost N$14.00 per month, or N$168.00 a year. The daily bag limit is ten, comprising one or more of the following species: blacktail (dassie), galjoen, kabeljou (kob) and West Coast steenbras. Minimum sizes are: blacktail 25 cm, galjoen 30 cm, kabeljou 40 cm, West Coast steenbras 40 cm. Other daily limits are 30 barbel, 20 snoek and one shark. Anglers may not take more than two kob longer than 70 cm each and two West Coast steenbras exceeding 65 cm each (both measurements including the head and tail) in one day. The open season for rock lobster is from 1 November to 30 April. The minimum carapace length is 65 mm. The daily bag limit is seven and no more than seven whole rock lobsters may be transported at a time. Per vehicle, each angler in possession of a permit may transport three times the daily bag limit, but not more than 10 of each of the following: Kob, steenbras, galjoen and blacktail. All four of these species must be in a whole state, head and tail included, in order to determine the size. Worms may not be used as bait, and red bait may not be cut or in any other way dislodged from the substrate. Only red bait that has been washed up on the beach may be collected. There are also limitations on the quantities of several marine resources that may be harvested for own use without a fishing permit. 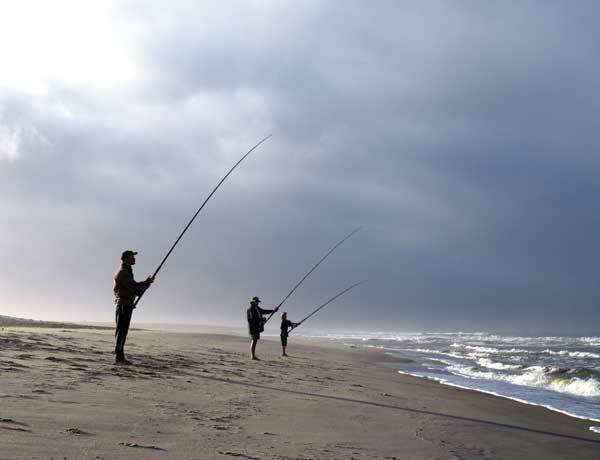 Fishing for recreational purposes is allowed only in the following areas: Terrace Bay and Torra Bay; from the Ugab River to Walvis Bay (excluding the Cape Cross area); Pelican Point to Sandwich Harbour; from the northern limits of Lüderitz Bay to Große Bucht; and from Pomona Island to the Orange River. the Penguin Bonanza Angling competition in December. Some of the most popular angling spots along the coast include Paaltjies, on the northern border of Sandwich Harbour, and the beach between Walvis Bay and Swakopmund. To the north of Swakopmund is the Dorob National Park, which stretches all the way to the Ugab River. Shore fishing is allowed in the park. Famous fishing spots along the shoreline between Swakopmund and Henties Bay are Mile 8, Mile 14, Die Drom just north of Wlotsksbaken, Bennie se Rooi Lorrie and Jakkalsputs. There are many more holes to the north of Henties, such as Sarah se Gat, Popeye, Mile 72 and Mile 108. 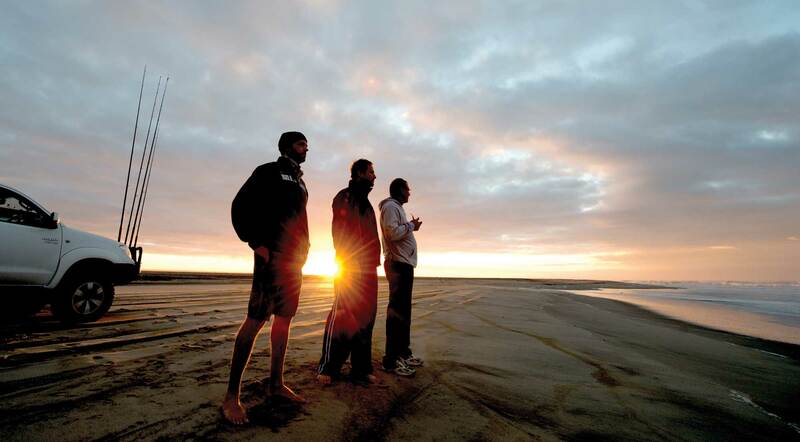 Further north of these popular fishing destinations lies the Skeleton Coast Park, a conservation area. Torra Bay and Terrace Bay are two highly sought-after angling settlements within the park. Managed by Namibia Wildlife Resorts, both have camping sites with toilets and showers. In Terrace Bay accommodation is also available in chalets with dinner, bed and breakfast. Families book months in advance to secure their campsite or chalet at these angling hotspots and often stay throughout the entire holiday season. Rock and surf angling may well be the most popular form of angling in Namibia, but many tour operators also specialize in offshore fishing excursions or shark fishing. Namibia is among the few countries in the world involved in the conservation of shark species. Though shark fishing is allowed, it is done exclusively on a catch and release basis, which means that all sharks must be returned to the sea unharmed. When angling for shark you may be lucky enough to pull out a Spotted Gulley Shark (Spotty), cow shark, hound shark or even a Bronze Whaler (Bronzy). Bronzies can reach weights of up to 190kg and dragging one out will be the fight of your lifetime! So if you enjoy spending hours on end on beautiful beaches with the soft roar of the ocean waves for company and the thrill of a nip at the end of your line sending adrenalin coursing through your veins, Namibia’s shoreline is the place for you. Get your bait, hook, line and sinker ready and cast away. If you plan to visit these two sites you need to make a reservation with Namibia Wildlife Resorts at reservations@nwr.com.na. NO day visits are allowed. Remember to stock up on all your angling needs at CYMOT before hitting the shoreline!